Just in case you had forgotten what we look like, he is the latest photo of Swindon Panel in restoration! As you can see – all the walls are now plastered and painted in the panel room, and carpet has been laid in the working area behind the panel. The ceiling cannot be complete yet as, until the panel is placed in its final position (which will be determined by a bit of trial-and-error), we don’t know exactly where the lights in the ceiling will be positioned, which affects the positions of other ceiling equipment such as air conditioning, etc. The moving back into final-position of the panel will also be the time at which it can be removed from its lifting frame. Wiring of the panel is well advanced. We are nearly complete in wiring the ‘live’ to one side of every switch and button in the panel, re-using as much of the original wiring as possible (and at considerable extra effort!). When this has finished it will be time to start wiring in the 8-core cables from the tag blocks to the PCBs that will interface to the “interlocking”. Exciting times ahead! It is planned that the first phase of the wiring will be an extension of our existing working section of panel at Wootton Bassett West, extending the control area west to the fringe at Alderton with Bristol PSB, followed by the addition of the main line between Wootton Bassett Jn and the fringes at Box and Thingley. SPS volunteers will work the panel and encourage visitors to have a go. Of course, no real trains will be involved, so it doesn’t matter if any mistakes are made! 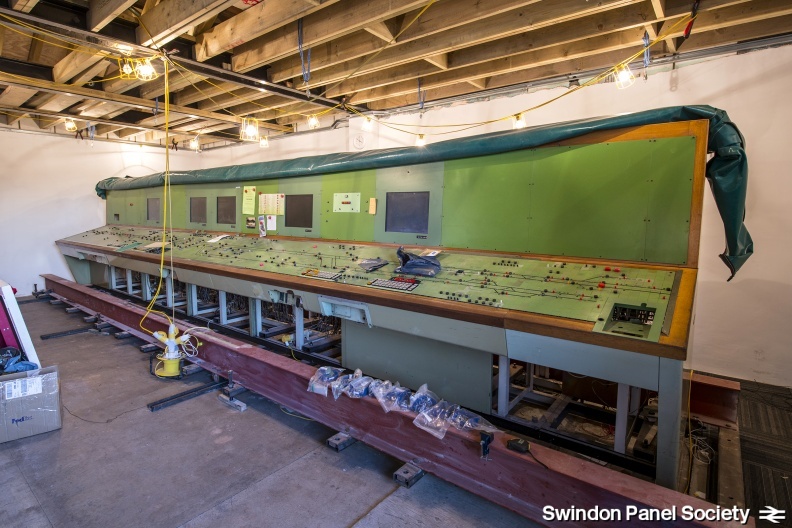 Experience in explaining Swindon Panel to people thus far has enabled us to identify the favourite questions that visitors like to ask (How old is it? When did it close? How many people worked it? Isn’t it all done by computer?) so we are confident it will be easy to equip you with the answers to these favourite questions. Don’t worry – it won’t be necessary to learn thousands of rules and regulations to volunteer for working the panel – it is not the plan to have major disasters playing out for the public! We will make sure you are aware of the principles of how things work about anything that the public might ask (such as “if a train breaks down, will the one behind crash into it?” and “What happens when there’s leaves on the line?”). The one question we might not be able to answer is “Why is my train always late?”, although I think we might all have our own views on that! If you have background railway or signalling knowledge you will be most welcome, but even if you don’t have the first clue where to start, don’t let that stop you! What better way is there to learn than in a completely safe, completely fun panel with no time or safety pressure? Please let us know via any of the usual means if you would be interested in learning more about working the panel. When doing so, please let us know if you have any existing relevant background knowledge as this will enable us to plan, and to make sure you get the help you need, but not the help you don’t! We look forward to seeing you all in the new year, we have many working days and special events on in the new year, and if you’re still considering your new year’s resolution – Helping for a day at Swindon Panel is an easy one!